New York, Miami, Chicago and Los Angeles. 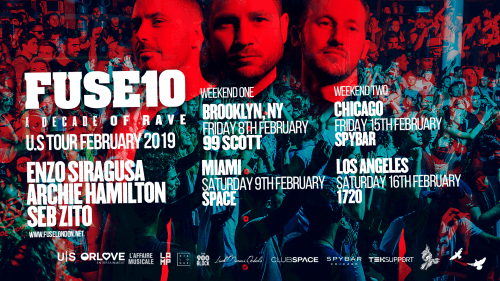 All dates featuring: Enzo Siragusa, Archie Hamilton, Seb Zito. Evolution has been a key player to FUSE’s success. In 2008 they sprung into the heart of London’s minimal scene as a breath of fresh air throwing pivotal weekly parties every Sunday. 10 years on, they have grown to be one of the capital’s most prominent party brands and labels and are recognized and celebrated across the UK and Europe for delivering outstanding events wherever they choose the challenge. They have championed residencies in Ibiza at Sankeys, Space and Amnesia, alongside annual events at ADE, Off Week and Sonus Festival. 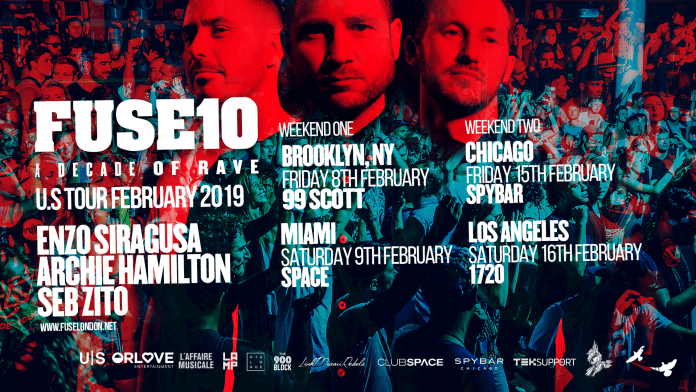 Now is the time to level up even further by kicking off their global 2019 FUSE10 tour in the United States.